The feel-good story of Jeremy Lin was marred by a distasteful footnote Wednesday night, courtesy of MSG. 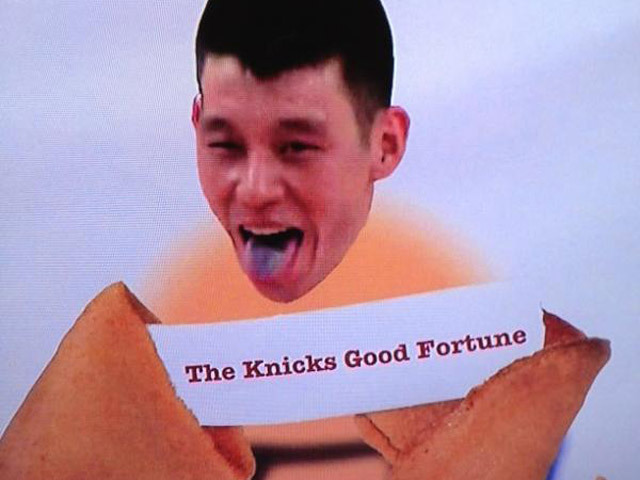 After Lin dished out 13 assists to lead the Knicks to their seventh straight win, the network aired this image of Lin's face over a broken fortune cookie with the words: "The Knicks Good Fortune." On Thursday afternoon, the network told CBSNews.com that the image shown during the telecast "was not an MSG graphic, it was one of many fan signs in the arena." Lin, the first Taiwanese-American to play in the NBA, has already been publicly disparaged for his race. Boxing champ Floyd Mayweather said earlier this week that Lin was being praised only "because he's Asian"and Fox Sports columnist Jason Whitlock posted a lurid Tweet that played on an Asian stereotype. (Whitlock later apologized). Lin is averaging 23.6 points, 9.8 assists, 1.4 steals, a 3-pointer per game and is shooting almost 50 percent from the field over his last five games.